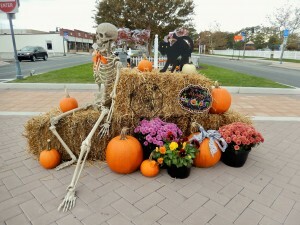 Bethany Beach gets dressed to celebrate Halloween. The beginnings of Bethany Beach started with the members of the Christian Church, also known as the Disciples of Christ, from Washington, D.C. area and Pennsylavania. It is a family seaside resort and originally these Disciples of Christ were looking for land for a permanent yearly seaside assembly for the Christian churches of the country. Amazing isn’t it? 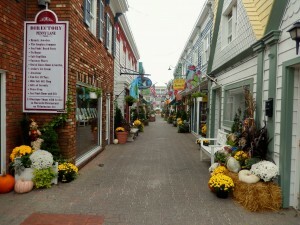 Today, as I passed by Bethany, my friend, Annie, told me how cute the town looked…..it is the week-end and the businesses are open in the Second Season. 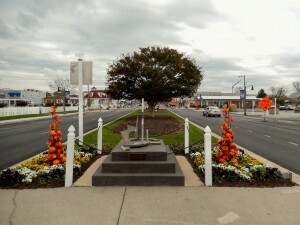 In 1934 the first paved road from Bethany Beach to Rehoboth Beach was completed. In 1952 the Chesapeake Bay Bridge was opened and dedicated….no more taking the ferry. In 1966 Baltimore Trust became Bethany Beach’s first bank……the good old days!! In 1973 St. Ann’s becomes the official Catholic Church parish, a new church is built. In 1974 the parking meters were installed….oh noooooo! In 1977 the First Indian statue was placed at Rt. 1 and 26….I remember Peter Toth working on it. In 1984 First July 4th parade and fireworks were held…..I took my son for the first time….he was 7 months. When I asked my friends if they wanted to go ghost hunting with Delmarva Historic Haunts, they were a little skeptical. But, they got out of their box and decided to join in….why not? 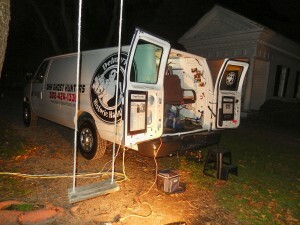 Last Saturday, October 25th, was the perfect night for such an adventure. But, first things first…..hungry we were and we did not have to be at the Lewes Historical Society until 10:15 p.m. You heard right….the event was the second of the evening…both sold out!! There is an interest about the paranormal, really. We arrived in Lewes with no idea where we would eat….then, the place around the corner. 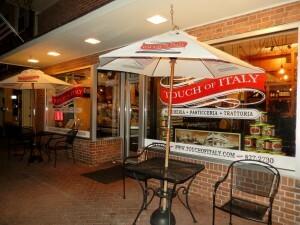 Touch of Italy located at 101 2nd St. in the heart of Lewes. 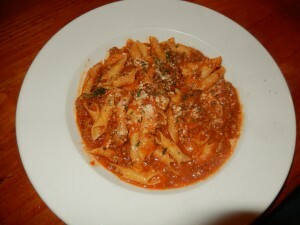 It was the perfect dinner; a table just for us in the corner, no rush, stay as long as you want. 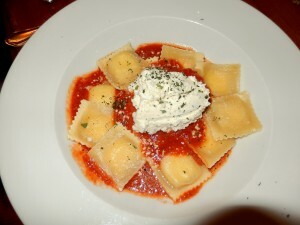 Their website is http://www.touchofitaly.com. Tel. 302-827-2730. A little wine and bread on the table. 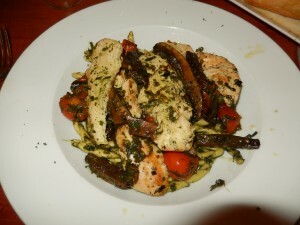 The Penne Pesto with Chicken…Awesome!! The service was so good. We all decided that the food was excellent and the perfect restaurant for such an interesting evening. 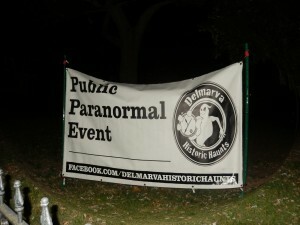 Last year I heard about Delmarva Historic Haunts. It was at this same time when, again, the Lewes Historical Society had them come to Lewes for a ghost hunting experience. When you think about it, Lewes is the first town in the First State. These homes and buildings are some of the oldest in the state. To understand the present, you have to unleash the past. And, that’s what we were going to do. We were going to visit the buildings that are under the Lewes Historical Society charge. 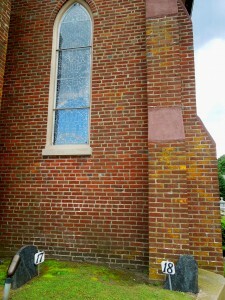 We met at the Lewes Historical Society Complex….at the School House. This school house c 1898 is one of the few one room schools left in Delaware. 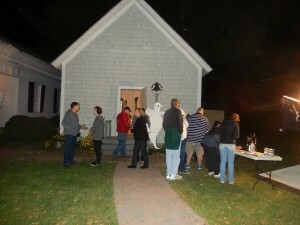 Everything was ready…the earlier ghost hunting brought a lot of activity to the visitors. Rick Coherd is the Founder and CEO of Delmarva Historic Haunts, which started in 2011. What he told us was that “The Past is the Future with The Lights On”. These buildings have seen wars, births, deaths, families….they have been lived. 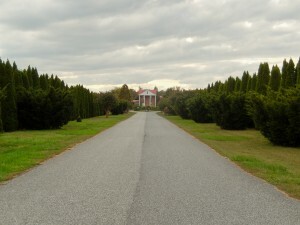 To know more about Delmarva Historic Haunts, please visit htpp://www.delmarvahistorichaunts.com. 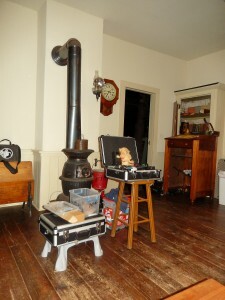 In the school house, there was a presentation and some of the instruments that they use for sensing paranormal activity. 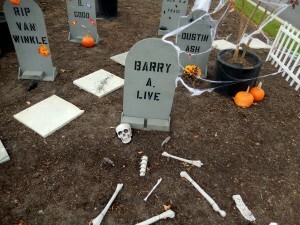 Delmarva Historic Haunts take their work seriously. 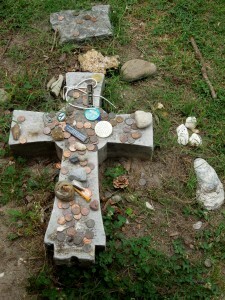 They offer “paranormal investigations and programs to help fund historical sites”. On that evening $2,500 were raised. Delmarva Historic Haunts donated those funds to the Lewes Historical Society. Thanks!! So, for the ones that want to joke around…he asked that we would not pinch our friends to pretend an entity had done so, if you get my drift. We were divided into groups. I was given a K-2 which lights up when sensing paranormal activity. They also brought along, what they called a torch….a flashlight. Then, another instrument for temperature. In each of the homes, a docent was present explaining the history of the structure or museum. Then, the next part of the tour was in the darkness, pretty much. So no more photos from me at this time. 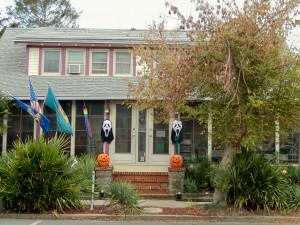 In the Lewes Historical Society Complex there are 9 buildings. These buildings “tell the story of Lewes through the centuries since its founding”. We also walked through Lewes towards the Cannonball House c 1760. This house was struck by a British cannonball during the War of 1812. It is located at the corner of Bank and Front Streets. Walking around Lewes at that time of the night when you are ghost hunting is an experience in itself. So, you want to know if we saw or felt anything right? Every time we entered one of the buildings we would go to the first designated room. We would say our names…..someone would ask to show their presence. The torch or flashlight would be placed on a table. We would stand back. The ones, like me, that were holding the K-2 would have them out for everyone to see if their were changes in the light colors. There was plenty of action, in all the dwellings. My neighbor, Chris, was one of those very skeptical. We were all in the Thompson Country Store. Darkness….questions asked, and flashlight kept going on and off depending on the question. Nobody was touching it. Chris said: “My thighs are so cold from the inside out”. They put the temperature gage and you could see the temperature dropping very rapidly. I think she was freaking out! My K-2 was flashing like crazy, and the guy next to me was feeling that coldness from the inside out, as well, from the toes to his chest. The funny thing is, Chris is never cold. She hardly wears a coat so as I write this I am laughing because just to see her face was priceless as she described it. Lol!! We were in the Cannonball House….3rd floor where activity is usually encountered. But, just as we got into the room, they said we had to move to the next museum. Everyone had left the room, except my friend, Debbie, and I. I turned around with my K-2 on hand and said “Come on aren’t you going to light this up?” OMG the K-2 started flashing like crazy going into different colors. Debbie and I were looking at each other and were then leaving the room and it was at the 3rd step of the stairs when it completely stopped. 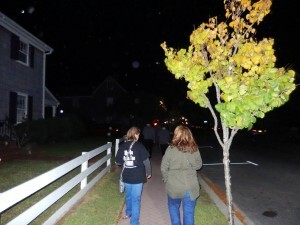 One more flashing after leaving the building and one more flashing on the corner…..I think the whole town has paranormal activity. 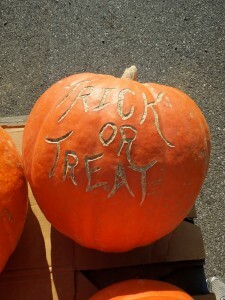 Delmarva Historic Haunts is planning on coming back in November. I will let you know. You have to have an open mind…. 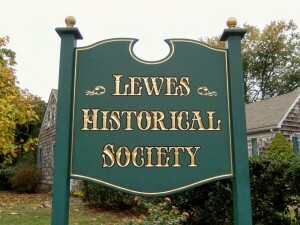 Check the website for the Lewes Historical Society by clicking on http://www.historiclewes.org. November 14th – Lunch & Learn. The Wreath-Making Industry of Milton. 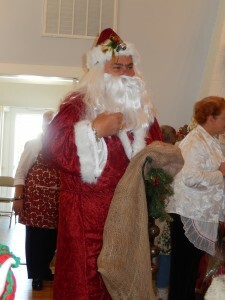 December 6th – The 41st Annual Christmas Tour of Lewes. 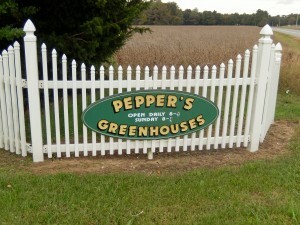 Pepper’s Greenhouses….13034 Cedar Creek Rd., Milton, DE 19968. Tel. 302-684-8092. Well, I will give you my Sussex County directions: From Rehoboth Beach go north on Rt. 1 or Coastal Highway, turn left on Rt. 16 west. Drive for a few miles and when you get to the stop sign in Milton, where the Food Lion is, turn right and immediately turn left. Follow that road for less than a mile and the Pepper’s will be on your left. 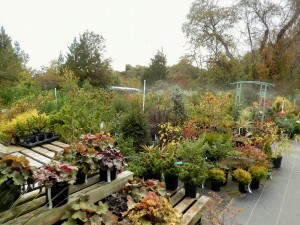 That easy and worth a trip to the greenhouses. This is a family operated busines. They have been doing so since 1985. 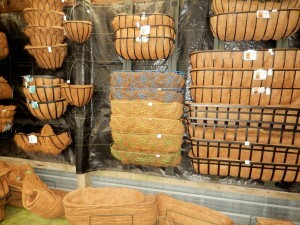 They also have online shopping and shipping within the United States. 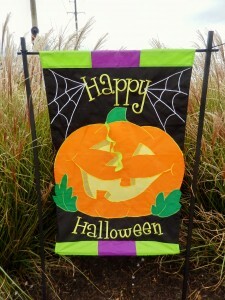 Visit http://www.accentsforhomeandgarden.com. They only close on Tuesdays at this time of the year. 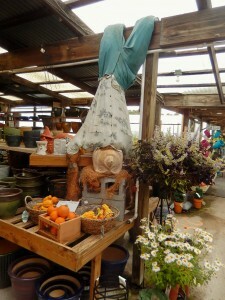 On Facebook you can find them two ways: Pepper’s Greenhouse or Accents for Home and Garden. Pepper’s takes a complete different aura in the Fall. Just like anywhere else it is a bit more quiet….well, let me correct myself. More quiet everywhere else unless you are Sea-Witching in Rehoboth Beach, or ghost hunting in Lewes….Those 2 Delaware Beaches do not stop year-round. Pepper’s greenhouses looked beautiful the other day. 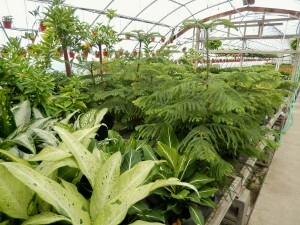 The weather is cooperating so if you still have some planting to do, take a drive over. 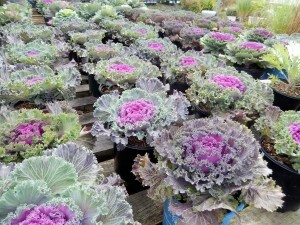 Plenty of cabbages, and winter pansies. 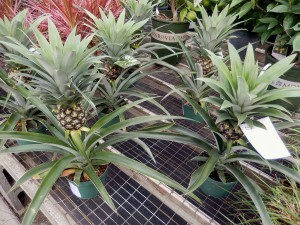 Strolling the greenhouses I found pineapples!! 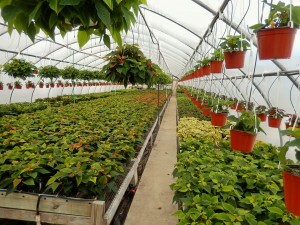 The poinsettias are slowly turning waiting their turn!! 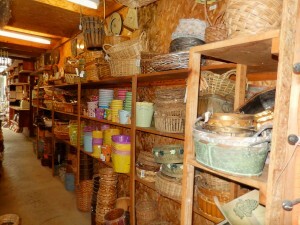 Pepper’s offers plenty accents for the home and garden. 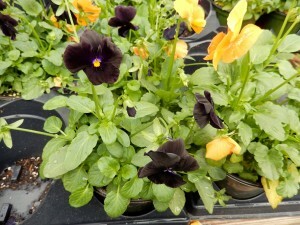 They also have ready made arrangements and a “forever” section of flowers…silks, etc. etc. It is going to be beautiful today!! Check it out! 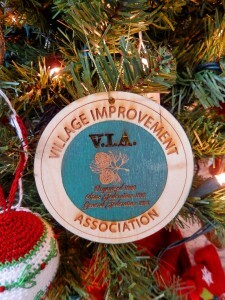 The Village Improvement Association (VIA) is located at Boardwalk and Grenoble Place in Rehoboth Beach, Delaware. Tel. 302-227-1631. Website? http://www.rehobothbeachvia.org. 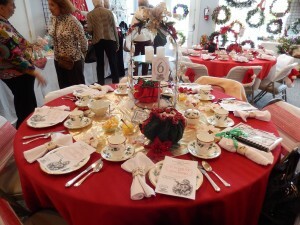 This is one of the oldest women’s civic and charitable organizations in Rehoboth Beach. It was founded in 1909. These women are powerful in Rehoboth Beach and they get things done!! 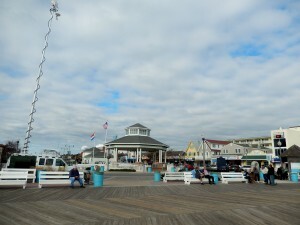 Since its founding days, the members have been making contributions to the town of Rehoboth Beach, as well as surrounding Cape Henlopen communities. The VIA is a member of the Delaware State Federation of Women’s Clubs (DSFWC) and the General Federation of Women’s Clubs (GFWC). To learn more about the VIA, and to find out their events, and what they are all about, please visit the website above mentioned. 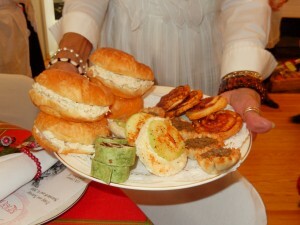 Last year was the first time I attended this elegant tea. For 2 days the members of the VIA present this tea to the guests in a traditional way. 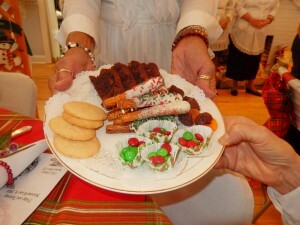 The delicious offerings were homemade, as they are every year. 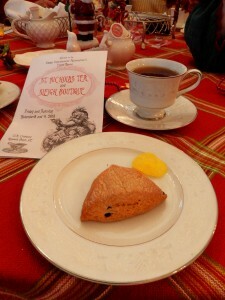 This year is its Ninth St. Nicholas Tea and Sleigh Boutique. 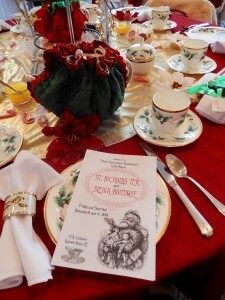 Tables are decorated by the members with their own china. If you wish to attend, please make your reservations soon. 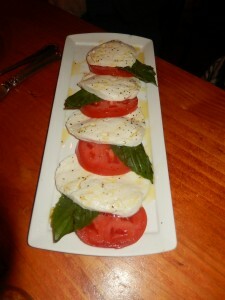 You may call for reservations 302-227-1631. Tea will be served in 2 seatings each day: 11 a.m. and 2 p.m. 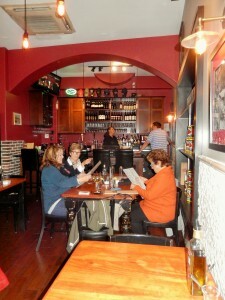 There are 10 tables seating 8 guests per table. The cost is $25/person, $15 for children 13 and younger. 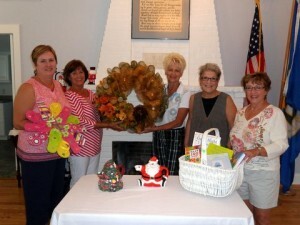 Craft, boutique and basket Chairwoman, Susan Siemionko, left, and Sherry Hall, Jennice McCarty, Francine Frederici and Carolyn Shriver show wreaths and a basket that will be for sale at the boutique. New this year is “A Boutique for All Seasons”, offering wreaths for winter, spring, summer and fall, as well as Halloween, Valentine’s Day and patriotic holidays. Please note that this boutique will open at 10 a.m., an hour before the morning teas, so shoppers who can’t attend the Tea will have a chance to purchase items. 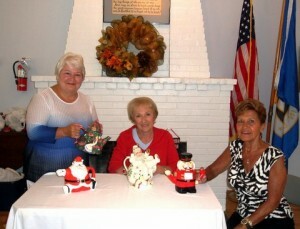 Event Chairwoman, Ann Sebastian, left, Marge Cintavey, and Carol Hall show holiday-themed tea pots. The St. Nicholas Tea and Sleigh Boutique gives you the opportunity to shop for the coming Holiday Season. 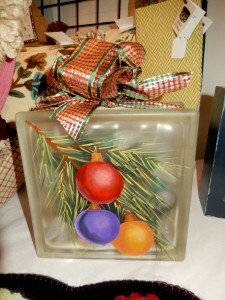 Besides the beautiful baskets, handmade crafts and Chritmas-themed items will be available. Local venders will be on hand to help with our Christmas shopping. The Piccadilly Lady, with her bottomless pockets, will sell wrapped surprises. And I am sure Santa will make a stop. 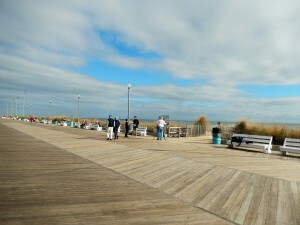 It is a gorgeous day at the Delaware Beaches and pretty soon the Downtown Rehoboth Beach will be celebrating another festival week-end!! 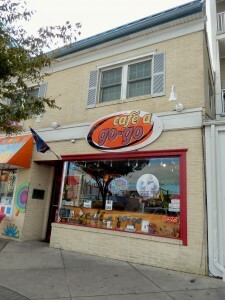 Plenty of places to stop for coffee in Rehoboth Beach, but Cafe A Go-Go, located in the heart of Downtown Rehoboth Beach at 102 Rehoboth Avenue has amazing coffee. Served with a smile by Jesus and Maria Ramirez; you are really going to be impressed with their coffee. Tel. 302-227-1099. 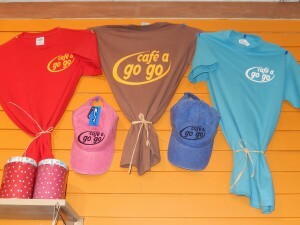 Cafe A Go-Go has been a fixture in Rehoboth for so many years now. It is comfortable, spotless, and a great place to hang out in the morning, not just to have coffee but to also have something to eat. 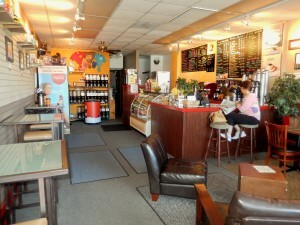 They serve bagels, bagel sandwiches, wraps and other goodies for easy eating at the beach. Their Mexican Mocha can turn out to be my daily addiction. Stop by and try it!! Jesus and Maria also serve green tea smoothies, and they do have gluten free oatmeal!! Have a great time at the beach….Jesus and Maria also speak Spanish in case you want to practice you language. 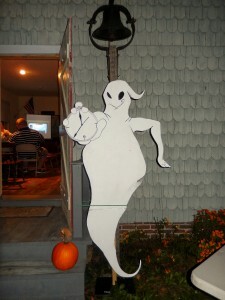 For the past couple of years every time the end of October approaches I start thinking about Delmarva Historic Haunts. 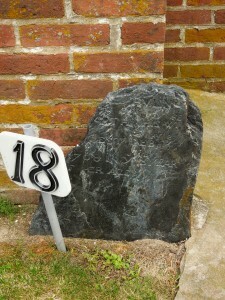 I wanted to go on one of the haunts…..Lewes is the perfect town for such an experience. Aren’t you curious? Lewes is The First Town in The First State. 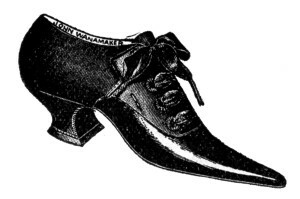 It was founded in 1631 and then incorporated in 1883. That makes it Delaware’s oldest settlement. Its history is on display throughout various historic buildings in Downtown Lewes. We are meeting Delmarva Historic Haunts, http://www.delmarvahistorichaunts.com at 10:15 p.m. at the Lewes Historical Society Complex….at the Schoolhouse. The haunt will begin at 10:30 p.m. 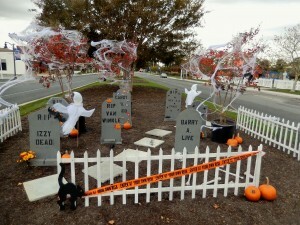 There is another “haunt” at 7 p.m. but I think the later one will be bone-chilling! Yikes! I am dragging a few of my usual suspects. They are always game for something outside of their box. I cannot help to think of Saint Peter’s Episcopal Church located at Mulberry St. and Second St. 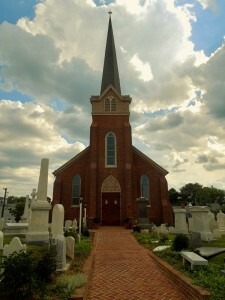 The parish was established in 1681 and the original building was completed in 1724…..This church has the oldest cemetery in the State. The graveyard is a snapshop of time. 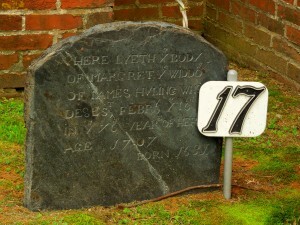 The 2 oldest graves are by the corner and against the wall of the church. The graves connect the past with the present. 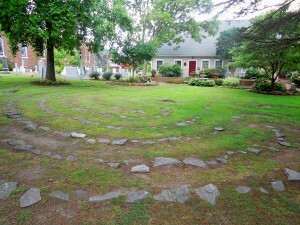 The Labyrinths at St. Peter’s are a path of peace. So will it bone-chilling or not? I will just have to let you know!! Note: An affiliate of NBC News will be filming on Saturday at this event. You can find Delmarva Historic Haunst on Facebook. Where is my shoe….the Sea Witch asked? Does it fit? 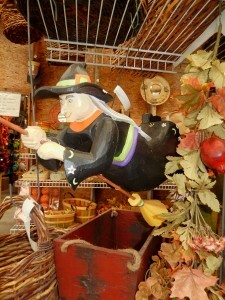 If it does, wear it in Rehoboth Beach as a celebration of the 25th Sea Witch Festival gets underway. 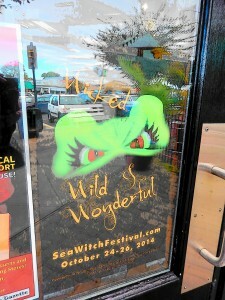 One of my local friends said to me ” Is it Sea Witch this week-end?” I replied “Do you live here?” He said “I can’t keep up with the festivals!” Ha ha…..the locals can’t keep up, but in reality they love all the excitement the Second Season brings to Rehoboth Beach, Delaware. The visitors say “Keep them coming”. “We love coming to the beach”. 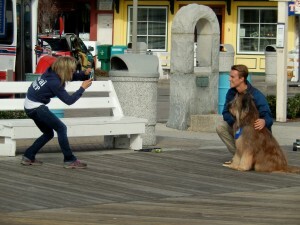 They were getting ready to film on the Boardwalk. 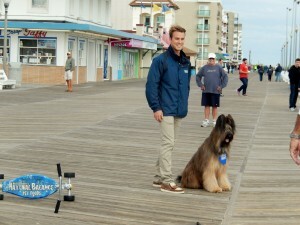 DelmarvaLife was broadcasting….and Norman, the scooter riding dog was patiently waiting his turn. Finally, it was time for Norman to shine, and as he rode the scooter and people clapped, and for the most part he made our day!! He will be around throughout the week-end. 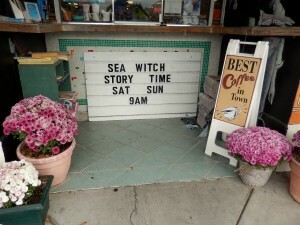 Story time at Browseabout Books on Rehoboth Avenue will be on Saturday and Sunday at 9 a.m. Your little young ones getting up early might like this activity. 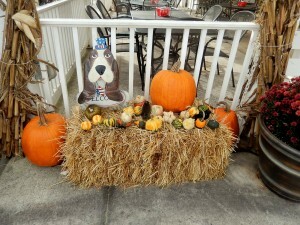 Out and About in Downtown Rehoboth Beach, the stores are into the spirit of the festivities. Lots of merchandise, plenty of it on sale. Tax free shopping in Delaware!! If you are vacationing with your pooch, Rehoboth Beach loves dogs….restaurants with outdoor seating like Grotto Pizza on the Avenue….welcomes your best friend. This week-end is going to be wicked and wonderful….Costume Parade, Dog Parade, Trick or Treating, Fun and Silly Games and Activities for the whole family!! 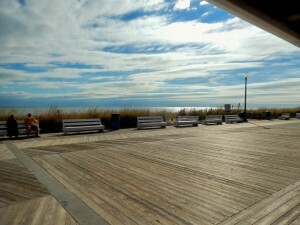 Don’t miss entertainment at the Rehoboth Beach Bandstand, Lantern Tours, 5K Race and more. 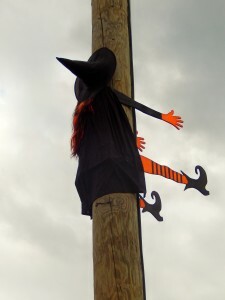 For a list of everything that is going on, please visit http://www.beach-fun.com/sea-witch-halloween-fiddlers-festival.html. Tel. 302-227-6446. 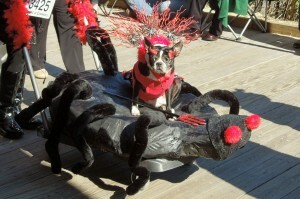 The Dog Parade on Sunday….a Must!! I love the title my Mother in Law gave to a family cookbook of recipes: Begged, Borrow, & Stolen. That’s how I feel when I use recipes. The good thing is that I usually change them with a little bit of this and a little bit of that. I make the recipes my own. 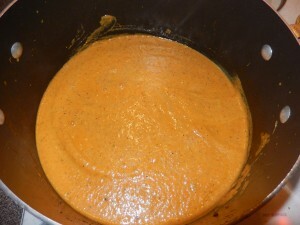 So, being that it is cooler, rainy, windy…and Fall, I think that the Curried & Apple Soup could be a keeper. 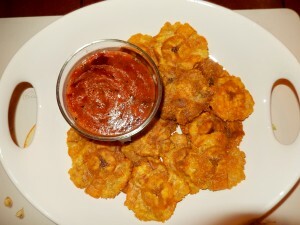 Served with a side dish of tostones or fried plantains and Mojito….it is even better. The word Mojito has been around for such a long time. 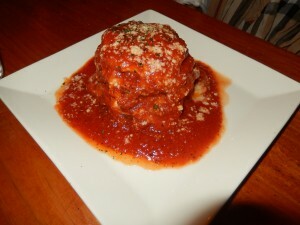 In Puertorican cooking it means a sauce made for dipping certain local delicacies. Carrots are so healthy and the saying of “an apple a day, keep the doctors away”, is probably so true, as well. Hope you like it. 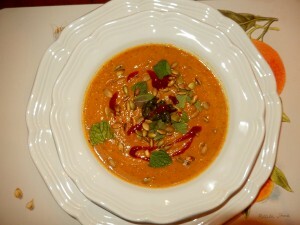 Garnish: Toasted pumpkin seeds, chopped mint, fresh cilantro or cilantro paste, and favorite hot sauce; optional. 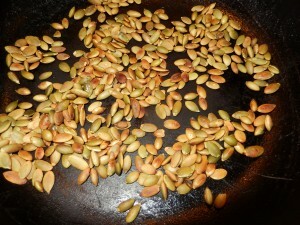 The pumpkin seeds were toasted on the stove in a frying pan. Make sure they do not burn. So good!! In a large saucepan, melt butter. 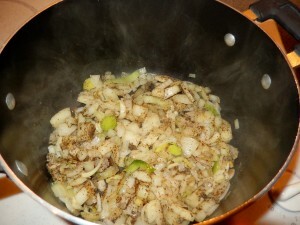 Add onion, leek, fennel, and a sprinkle of salt and pepper. Cook stirring here or there until softened and veggies are browning. 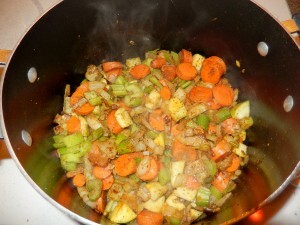 Add carrots, celery, apple, gingersnaps, curry powder, garlic, ginger, and thyme. Cook until the carrots and celery soften somewhat. Add chicken stock and apple cider. Bring to a boil. Simmer over moderate heat for about 15 minutes until the veggies are very soft. If using thyme sprigs, remove, otherwise, continue with the next step. Working in small batches, depending on the size of your blender, puree the soup with the sour cream and vinegar until smooth. What I did was mixed the sour cream with the vinegar and added a tablespoon with each batch. This is a creamy soup so, make sure there are no lumps. You can reheat the soup and seasoned it with salt and pepper, if necessary. Laddle the soup into bowls and top it with the garnish above mentioned. ENJOY! I decided that Tostones or Fried Plantains would be great with this soup. A meatless meal, no less! Plantains are a starch. 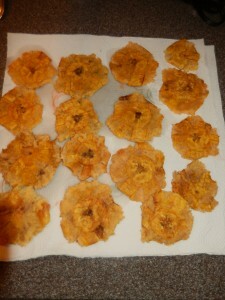 If you let them ripen, then, they are sweet and if green you can make Fried Plantains. For the longest time I used to mashed them with a plate, but now I have my Tostonera from Puerto Rico. 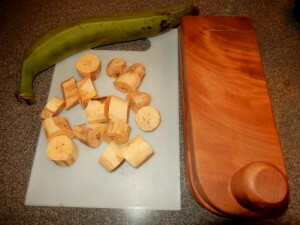 The Tostonera and the Pilon are a necessity when cooking Puertorican food. 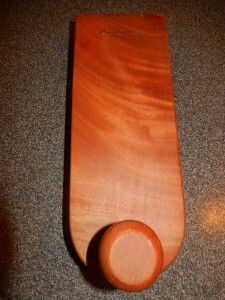 The Pilon is very versatile…use it to mash garlic, make mojito, and other PR dishes. 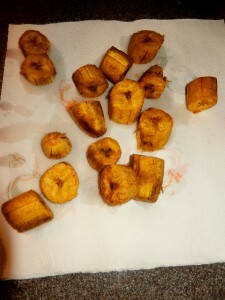 The plantain was peeled, cut, and ready for the next step of frying. 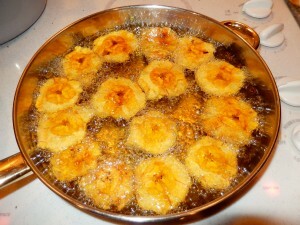 Fry the chunks of plantain in oil until lightly browned. 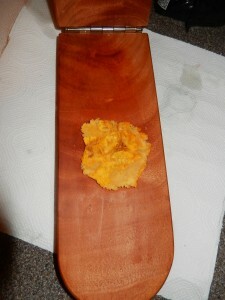 Then, place on the tostonera, or between wax paper. The tostonera is going to make it so much easier to mash. Otherwise, while between the wax paper, mash with a plate. 2 plantains were used on that evening. Finish mashing them and keep on paper towels until the next step. Heat the oil back again and place the mashed plantains in batches once again. They will rise to the surface. Let them get nice and light brown. Take them out and place on paper towels again to drain the oil. 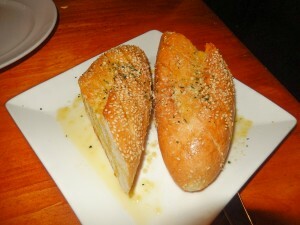 You can serve them on a platter with just butter and garlic salt. 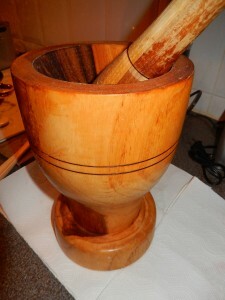 Or you can make the mojito by placing in the Pilon or Mortar 1 garlic clove, a pinch of salt. 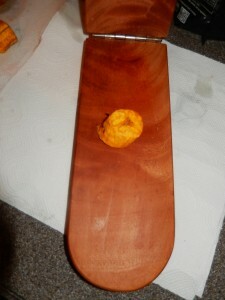 Then with the pestle, crush garlic and salt together. Add a bit of olive oil, a tablespoon or so, a small can of tomato sauce, tabasco and cilantro. Then squeeze half a lime and add it, as well. That’s it. Note: This recipe is gluten free. Make sure you check the tomato sauce, the chicken stock, and apple cider. Have a good one! !